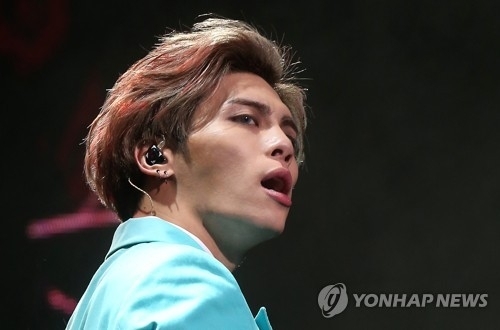 SEOUL, Dec. 19 (Yonhap) -- The late Kim Jong-hyun of K-pop group SHINee has left a painful suicide note revealing the state of his depression during his final days, according to a close musician friend Tuesday. Kim, better known by his stage name Jonghyun, died in an apparent suicide in southern Seoul on Monday. He was rushed to a hospital in a state of cardiac arrest but was pronounced dead. A few hours before being found unconscious, the singer sent ominous text messages to his sister saying, "Please let me go. Tell me I did well" and "Final farewell." 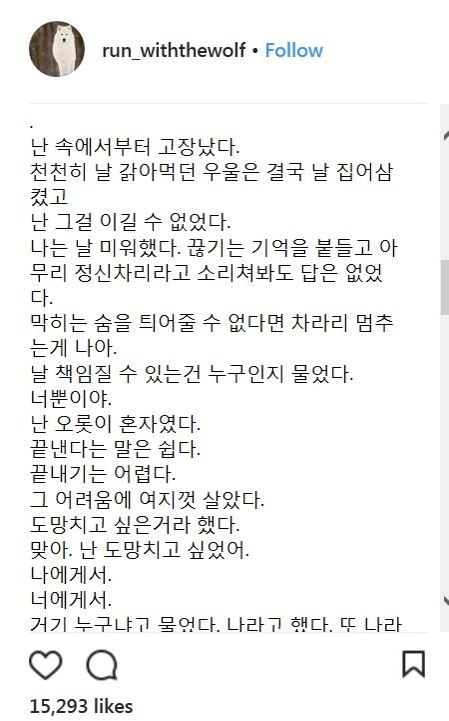 Jang Hee-yeon, lead singer of rock group Dear Cloud, posted on her Instagram what she called Kim's suicide note. Jang, a close friend of Kim, stated the late singer wanted his final words to be made public and that the family was consulted beforehand. She did not specify when the note was written. "I'm broken from the inside. The depression that has slowly nibbled me away has now devoured me, and I couldn't overcome it," Kim wrote. Kim continued, "I thought being a doctor was so easy when blaming it on my character in a quiet voice. It's amazing that it hurts this much. No one alive is more tormented nor weaker than myself." The singer also appeared to regret his life in the public spotlight. "Becoming famous was probably not my life. They tell me that's why I'm having a hard time ... Why did I choose that? It's funny that I'm able to endure this much." He ended the note by saying, "Tell me this is enough, that I did well. Even if you can't smile, don't send me off blaming me. You did well, you did good. Goodbye." Yoon Dong-hwan, head of MYmusic Entertainment, management company for Dear Cloud, said the suicide note was made public after talking with Kim's family. "It's not clear exactly when it occurred, but when Jonghyun sent this (to Jang), it was immediately passed on to his family," said Yoon. He added, "After the tragic incident, we discussed whether or not to make it public. The family decided to reveal it." The police, meanwhile, said an autopsy will not be performed on Kim's body. "No autopsy is scheduled since circumstances seem clear that the deceased took his own life. The family also doesn't want a post-mortem," an official at the Gangnam Police Station in southern Seoul said. The police plans to wrap up the investigation after speaking with the singer's family members. A private mortuary for Kim will be set up at Asan Medical Center in eastern Seoul. S.M. Entertainment plans to prepare a separate area for fans to pay their respect at the hospital.